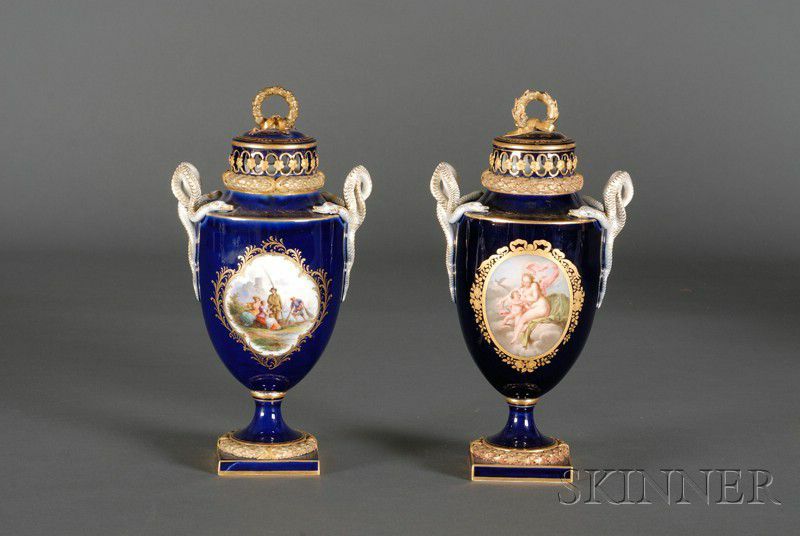 Two Similar Meissen Porcelain Cobalt Blue Snake-handled Potpourri Urns, late 19th century, tapered ovoid, lids with wreath finials, pierced to circumference and molded with patera, with entwined snake-form handles, cobalt blue ground, one painted with roundels of classical scenes (a fleeing nymph verso, Venus and Cupid recto), the other with trefoils (a fisher-folk scene verso, floral bouquet recto), on trumpet foot with molded wreath border, on square base, ht. 11 in. 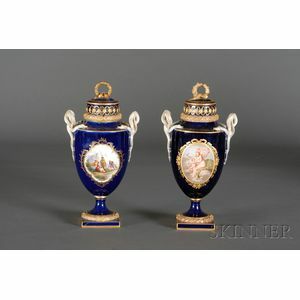 both lids with restorations to wreaths, and small losses to the ribbons. one of the restorations with craqueling to surface.